How big is baby? The size of an Onion! Baby Development FYI: Baby continues to beef up. Now she’s about 5.1 inches long and weighs about 5.9 ounces. Her rubbery cartilage is now turning to bone. And she’s growing some meat on those bones — putting on some fat. She’s growing a stronger, thicker umbilical cord, too. My body has been invaded, how’s that going? Feeling the round ligament pain. It’s more annoying and uncomfortable than painful. I think I felt an actual ligament…pop? It felt like a bunch of threads on the side of my belly just snapped all the sudden. I haven’t gotten the dark line from my belly button to my pelvic bone, but the little hairs have gotten darker, kinda funny. Speaking of the belly button, it is getting shallow. Baby-mobile. Been car shopping for something with more room and conveniences, but is not a minivan. Not that there is anything wrong with a minivan, I’m just not ready for the jump. Maybe in 5 years? The top of my list right now, Honda Pilot and Mazda CX-9. Back to the cloth vs. disposable diaper decision. I really wanted to cloth diaper, but after really thinking about what would be realistic for us, disposable diapers seem to be best fit. Crazy Cravings: HAMBURGERS. I just want to slather ten in ketchup and a ton of mustard. Oh and with onions! Also had a weird craving during church… George’s Original BBQ Sauce with cucumbers. So a barbecue pickle. Haven’t satisfied the craving yet. Highlights: Being at the beach, relaxing, sleeping in, pigging out, etc. It was a great last vacation JUST US. Our nephew who is about 9 months was there. He was a ball and so entertaining! He left (with his momma and daddy) Saturday afternoon and Nate and I just looked at each other “now what do we do?” It was kinda boring without the baby so we packed up and left the beach a day early. So we both agreed that was a good sign that we are ready! Glad you enjoyed your vacation. 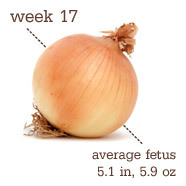 You look fabulous for 17 weeks. Cloth diapers really aren't that bad, particularly if you opt for a fancier kind. We use bummis tots bots and they're exactly like a disposable, but with two extra loads of laundry a week.Hamburgers (any beef really) were my only pregnancy craving. Cloth diapers are great and they really have come along way. They are also way cuter than disposables!I was feeling unsure about cloth. 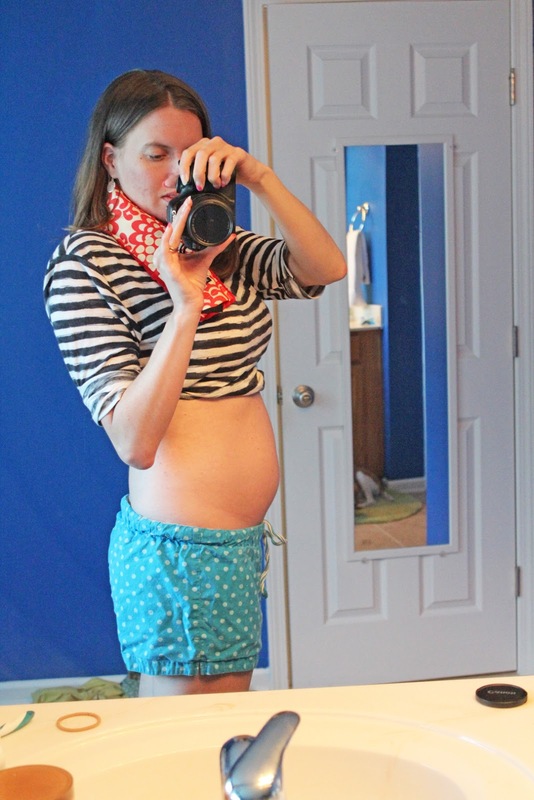 And now that I have decided to go with disposables, I feel very comfortable and relaxed about diapering. So that alone tells me, it's the right decision, for us.How old is your baby and boy or girl?